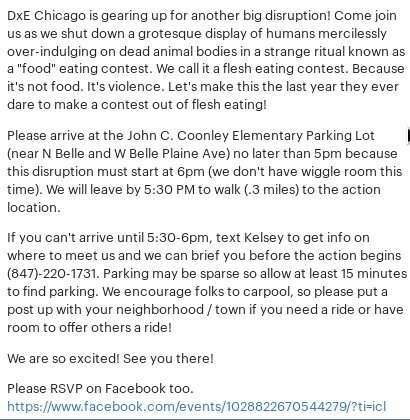 Meetup.com still has a post from Vegan Chicago about their plans to disrupt and “shut down” Friday’s eating contest at Ribfest Chicago. They have changed their assembly site from a restaurant to John C. Coonley Elementary School. 16 people have said they are going. just bring water guns and shoot it them at their feet. You won’t go to tail and nothing makes one more upset than wet socks. anonymous: I hope this event comes back. Posts © 2005-2019 ojrifkin · Original design by Beccary · Sponsored by Weblogs.us · XHTML · CSS 6 queries. 0.255 seconds.